BMT Broadway Line at Whitehall Street, R-160B no. 8942 on "W", last day of "W" service. Photo by Zach Summer, June 25, 2010. This is a two-track and four-track line extending northerly from a point near Morris street, from a connection with the Whitehall-Montague Street line, under Trinity Place, Church and Vesey streets to Broadway; thence under Broadway, Seventh avenue, 59th and 60th streets to a crossing under the East river to Queens, connecting there at the Queens Plaza station with the Queens lines. This line is two-track to Park Place, four-track under Broadway and Seventh avenue to 59th street, and thence a two-track line. In addition, tracks are provided for sidings. A turnout is provided for a connection at Canal street to the Manhattan bridge, and provision is made for a future extension of the line up Eighth avenue. The Broadway-59th Street subway consists of Route No. 5, Sections Nos. 1, 1-A, 2, 2-A, 3 and 4, and Routes Nos. 4 and 36, Sections Nos. 1 to 5 inclusive, and Route No. 61. Route No. 5, Section No. 1. — A two-track subway through Trinity place and Church street from a point 50 feet north of the north line of Morris street to 80 feet north of the center line of Dey street. Fredereck L. Cranford, Inc., contractor. Date of contract, September 27, 1912. Contract period, 40 months. Summary of contractor's bid, $1,222,269.20. Route No. 5, Section No. 1-A. — Beginning at a point under Church street, Manhattan, near Dey street, and extending thence under Church street private property, Vesey street, and again under private property to Broadway between Vesey and Barclay streets, thence under Broadway to a point near Park place. Frederick L. Cranford, Inc., contractor. Date of contract, September 27, 1912. Contract period, 40 months. Summary of contractor's bid, $982,740.70. Route No. 5, Section No. 2. — Extends from a point under Broadway, near Park place, and thence along Broadway to a point near Walker street. The Degnon Contracting Company, contractor. Date of contract, February 6, 1912. Contract period, 40 months. Summary of contractor's bid, $2,85.5,828.50. Route No. 5, Section No. 2-A. — Extends along Broadway from about Walker street to Howard street. The O'Rourke Engineering Construction Company, contractor. Date of contract. July 17, 1912. Contract period, 48 months. Summary of contractor's bid, $912,351.60. Route No. 5, Section No. 3. — Extends along Broadway from about Howard street to Bleecker street. The Underpinning and Foundation Company, contractor. Date of contract, January 19, 1912. Contract period, 40 months. Summary of contractor's bid, $2,295,086.50. Route No. 5, Section No. 4. — Extends along Broadway from about Bleecker street to about 15th street in Union Square park. The Dock Contractor Company, contractor. Date of contract, August 19, 1913. Contract period, 36 months. Summary of contractors bid, $2,578,078. Routes Nos. 4 & 36, Section No. 1. — This contract extends from Union square at 15th street under Broadway to 26th street. Date of contract, August 1, 1913. Contractor, E. E. Smith Contracting Company. Contract period, 36 months. Summary of contractor's bid, $2,056,702.50. Routes Nos. 4 & 36, Section No. 2. — This section extends under Broadway from 26th street to 39th street. Contractor, United States Realty & Improvement Company. Date of contract, July 23, 1914. Contract period, 32 months. Summary of contractor's bid, $2,657,004.50. .... an agreement was executed with the contractor for the construction, for a lump sum of $72,000, of a special track floor at the Sixth Avenue intersection so that the proposed Grand Central extension of the Hudson & Manhattan Railroad,. passing thereunder may at some future time be built without endangering the City's subway. Routes Nos. 4 & 36, Section No. 3. — A four-track subway under Broadway and Seventh avenue, from about 38th street to about 51st street. Holbrook, Cabot, & Rollins Corporation, contractor. Date of contract, September 1, 1915. Contract period, for completion of railroad ready for operation, and for the entire contract 30 months. Summary of contractor's bid, $3,740,913.50. 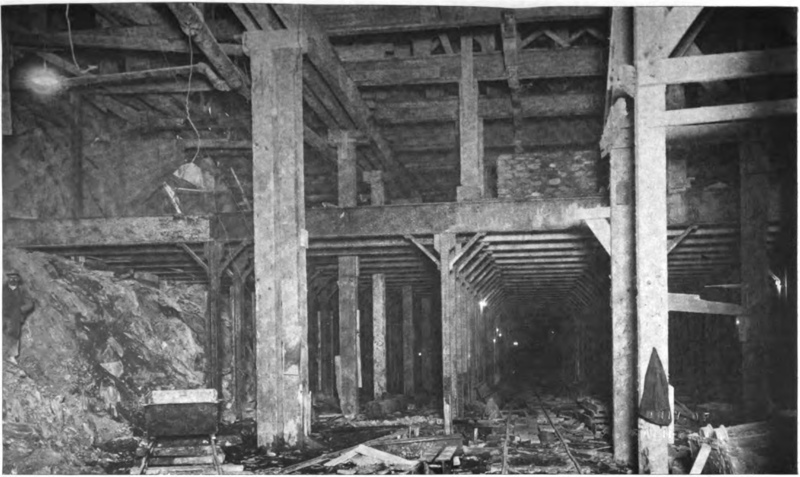 The railroad structure on this section is located in part beneath the Times Square station of the First Subway. At 45th street the westerly portion of the railroad structure will be located under the easterly track of the First Subway. The depth of excavation varies from 44 feet at 42nd street to 24 feet at the north end of the section. Within the limits of the express station at and south of 42nd street the railroad occupies practically the entire width of Broadway. Routes Nos. 4 & 36, Section No. 4. — A four-track subway, under Seventh avenue, extending from 51st street to 59th street, where two tracks diverge, curviug easterly into Central park to meet Section No. 5 of this route, and a four-track spur curve to the west to provide for a possible extension along Eighth avenue. The design as made will avoid grade crossings between the 59th Street branch and the extension to Eighth avenue. Litchfield Construction Company, contractor. Date of contract, May 20, 1915. Contract period, for completion of railroad ready for operation, 22 months, and for the entire contract, 26 months. Summary of contractor's bid, $1,937,509. Routes Nos. 4 & 36, Section No. 5. — A two-track subway, beginning near the east line of Seventh avenue and extending eastward under Central park, 59th and 60th streets to the easterly side of Second avenue. Contractor, Degnon Contracting Company. Date of contract, August 7, 1914. Contract period, 29 months. Summary of contractor's bid, $2,819,511. Contract price as modified, $2,319,511. 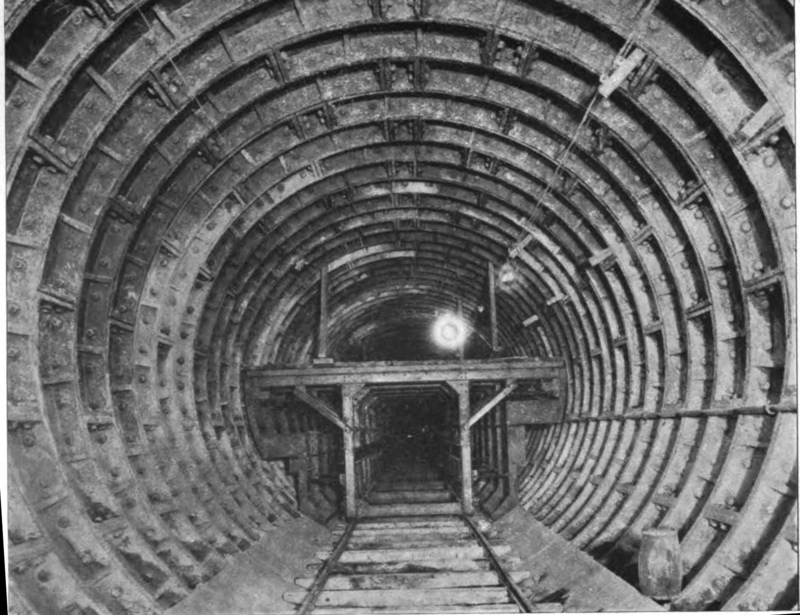 As origainally planned, the contract prescribed the construction of single-track tunnels, one each through 59th and 60th streets between Fifth and Second avenues; the separation of the tracks beginning at a point between Fifth and Sixth avenues. The layout was made so that the tracks would connect with a proposed approach to the Queensboro bridge in connection with the reconstruction of the bridge in such a manner as to permit of the operation of subway trains. In the early part of the year 1915 the contractor made a formal offer to the Board of Estimate and Apportionment of the City of New York, proposing to construct a two-track railroad through 60th street from Fifth Avenue to the east end of the section, instead of the single-track railroad through 59th and 60th streets, at a reduction of $500,000 from the bid price. The proposal carried with it a guarantee that the construction of two tubes under the East river to connect with the Queensboro subway at the Queens plaza in the Borough of Queens would cost not to exceed $4,500,000. The reason advanced for this offer to change the routing was that the reconstruction of the Queensboro bridge to provide for subway train operation would decrease the width of the vehicular roadways to such an extent that its use for vehicular traffic would be seriously impaired. Upon the request of the Board of Estimate and Apportionment a new two-track route (known as Route No. 61) was laid out, beginning in 59th street west of Fifth avenue, and curving diagonally across Central park and the plaza to and under East 60th street and the East river to the Borough of Queens where it joins the Queensboro subway. The necessary modifying agreement was delivered January 19, 1916. Route No. 61 (as known for construction purposes). — This route, the whole of which was previously described in connection with revised Section No. 5 of Routes Nos. 4 & 36, is a two-track subway in Manhattan, beginning at Second avenue, thence crossing the East river in two separate tunnels, emerging from the ground in Queens near Hancock street, where it becomes an elevated line and connects with the Queens Elevated lines on the Queens plaza near William street. There will be two construction shafts for this route, one at Avenue A, Manhattan, and one on Blackwell's Island. These shafts will also serve as permanent ventilation shafts. The contract for the construction of this route was executed August 3, 1916. Patrick McGovern & Company, contractor. Contract period, 30 months. Contractor's bid, $4,194,797. Broadway-59th Street Subway, Steel Members Being Placed Before Rock Excavation is Completed. PSC report 1916. 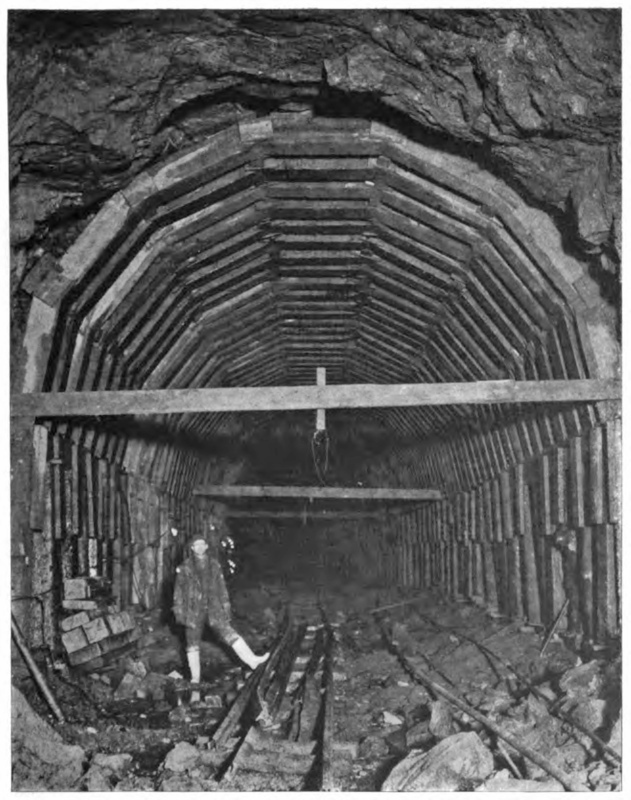 Broadway-59th Street Subway, Completed Structure and Unexcavated Rock in Close Proximity. PSC report 1916. 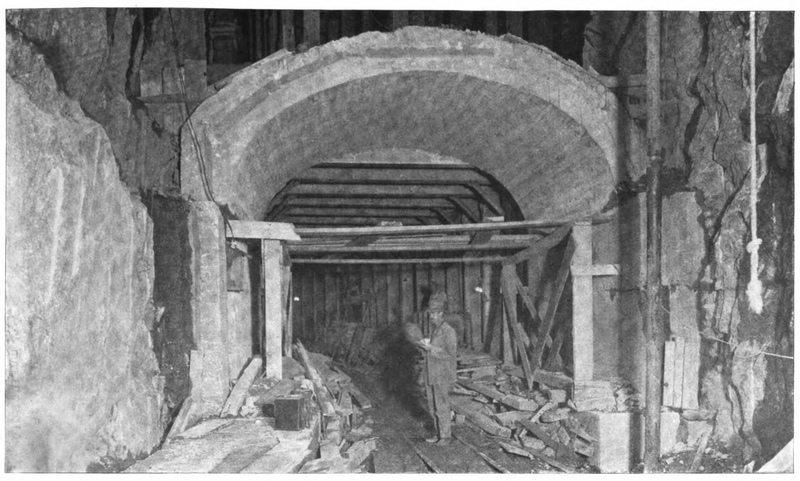 Broadway-59th Street Subway, Excavation and Open Cut Under Corner of Central Park. PSC report 1916. Broadway-59th Street Subway, Steel and Concrete Construction at 59th Street and 7th Avenue. PSC report 1916. This is a two-track subway connecting the Broadway-59th Street subway with the Fourth Avenue subway in Brooklyn. It extends from Trinity place and Morris street under private property, Whitehall street and the East river to Montague street, Brooklyn, thence under Montague, Fulton and Willoughby streets to Flatbush avenue extension. It is known as Route No. 33, and is divided into three contract sections, Nos. 1, 2 and 3. Route No. 33, Section No. 1. — This section extends from Trinity place and Morris street under private property crossing under Broadway and Bowling Green to and under Whitehall street to South street. Contractor, Flinn-O'Rourke Co., Inc. Contract executed June 17, 1914. Contract period, 32 months. Summary of bid, $2,059,182. Route No. 33, Section No. 2. — This section extends from the foot of Whitehall street, Manhattan, to a point under Montague street, Brooklyn, between Henry and Clinton streets. A spur for future connections runs from the foot of Broad street and connects with the main line at the Manhattan pierhead line. The contract calls for two single-track, cast-iron lined tubes to be driven from headings located on both sides of the river. 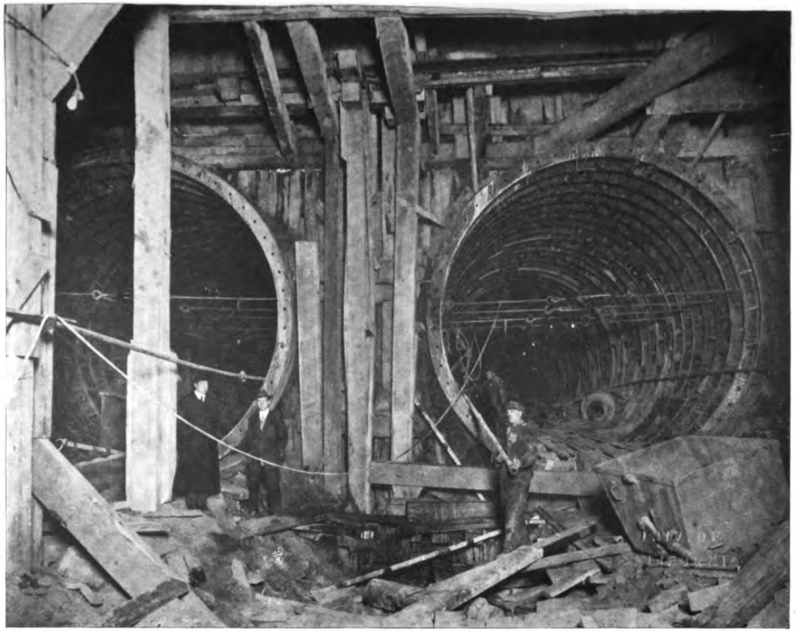 In addition to the single-track tubes, the work also includes the construction of two permanent ventilating shafts, one on each side of the river, to be sunk as caissons. Contractor, Flinn-O'Rourke Co., Inc. Date of contract, June 17, 1914. Contract period, 32 months. Summary of contractor's bid, $5,974,809.50. For the construction of this line, property was acquired at the foot of Montague street. This property has now been transferred to the Dock Department, which department will have a pier con- structed over the tubes for its protection. Route No. 33, Section No. 3. — For convenience of construction, this section includes the connection under Fulton street, Brooklyn, from the new subway in Clark street, Route No. 48, Section No. 3, to the First Subway at Willoughby street, and also the extension of the new line under Montague, Fulton and Willoughby streets from Clinton street to a junction with the Fourth Avenue subway at Flatbush avenue extension. Flinn-O'Rourke Co., Inc., contractor. Date of contract, October 9, 1914. Contract period, 36 months. Summary of contractor's bid, $4,395,152. This contract covers the construction of two single-track, cast-iron-lined, shield-driven tubes for the New York Municipal Railway line, and two similar tubes between Clinton and Pierrepont streets, and a double-decked steel bent and concrete structure in Fulton street between Pierrepont and Willoughby streets for the Interborough Rapid Transit connections. 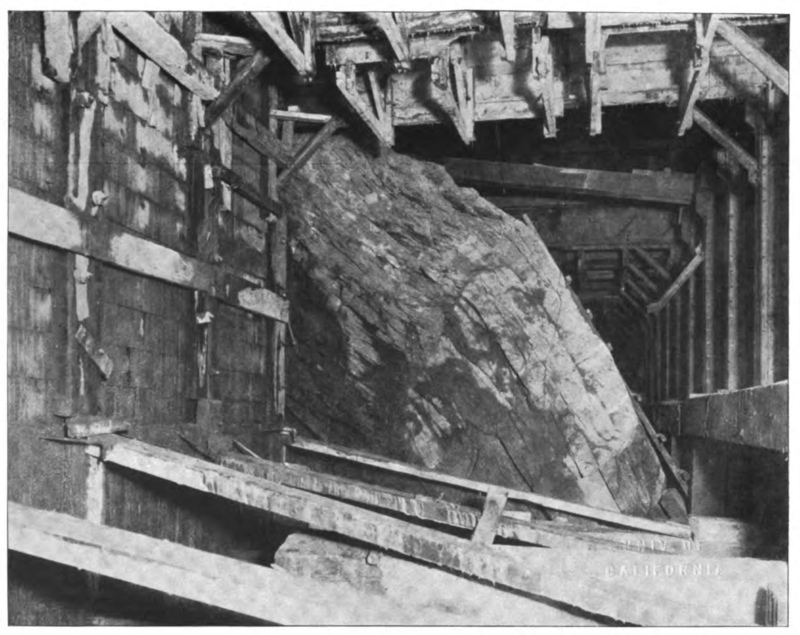 Montague Street Tunnel Line, Timbered Section in Heavy Rock. PSC report 1916. 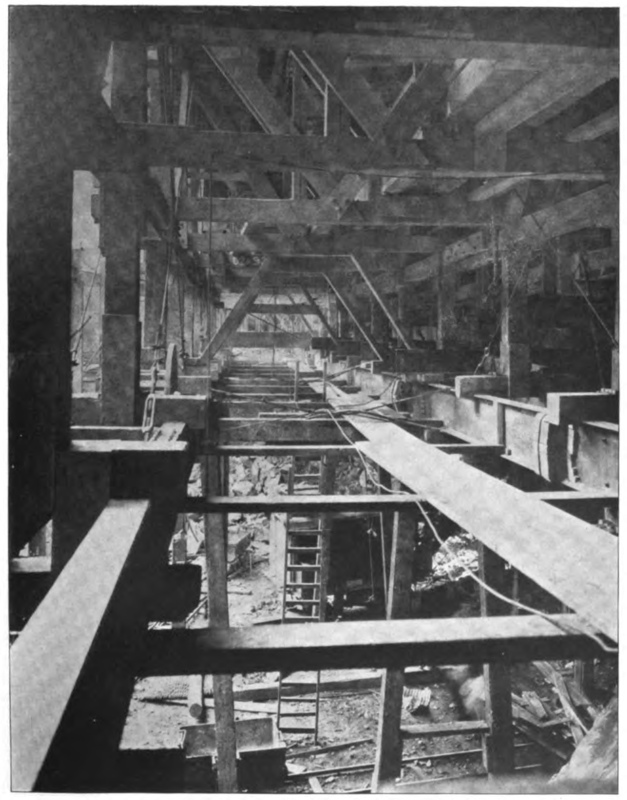 Montague Street Tunnel Line, Erection of Iron Lining near Whitehall Street. PSC report 1916. 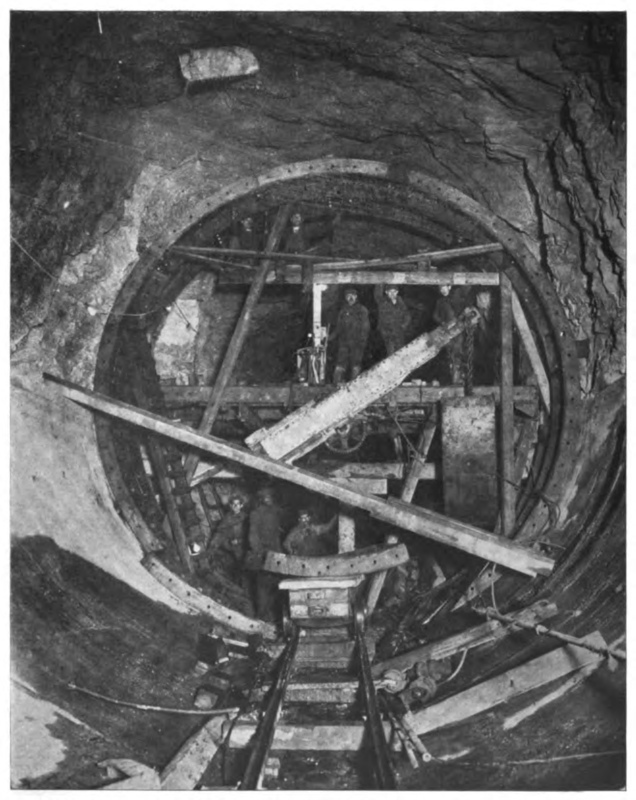 Montague Street Tunnel Line, Lawrence Street Fan Chamber and Tunnel Tubes. PSC report 1916. Montague Street Tunnel Line, Timbered Rock Tunnel with Concrete Invert Ready for Cast Iron Lining. PSC report 1916. 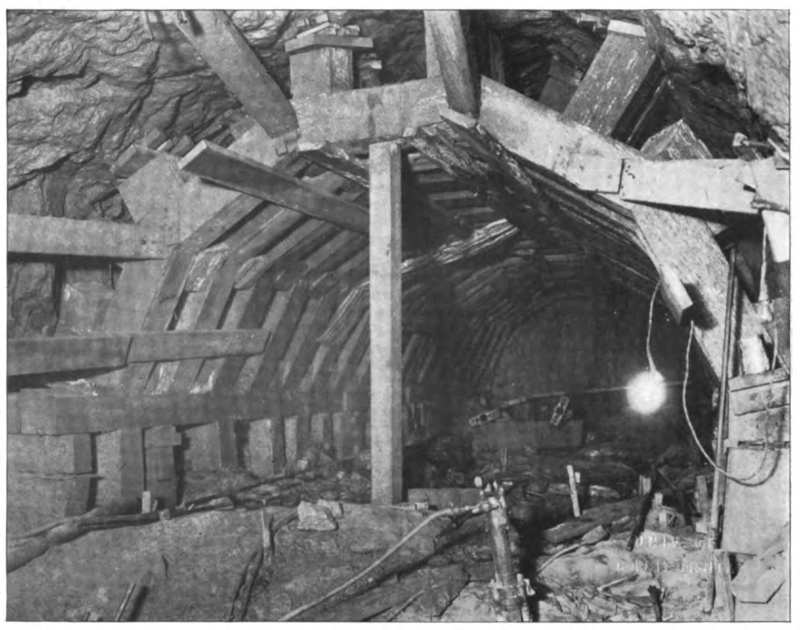 Montague Street Tunnel Line, Timbered Top Heading; Removal of Rock Bench in Tunnels. PSC report 1916. Montague Street Tunnel Line, Collapsable Steel Form for Sidewall Concrete. PSC report 1916. 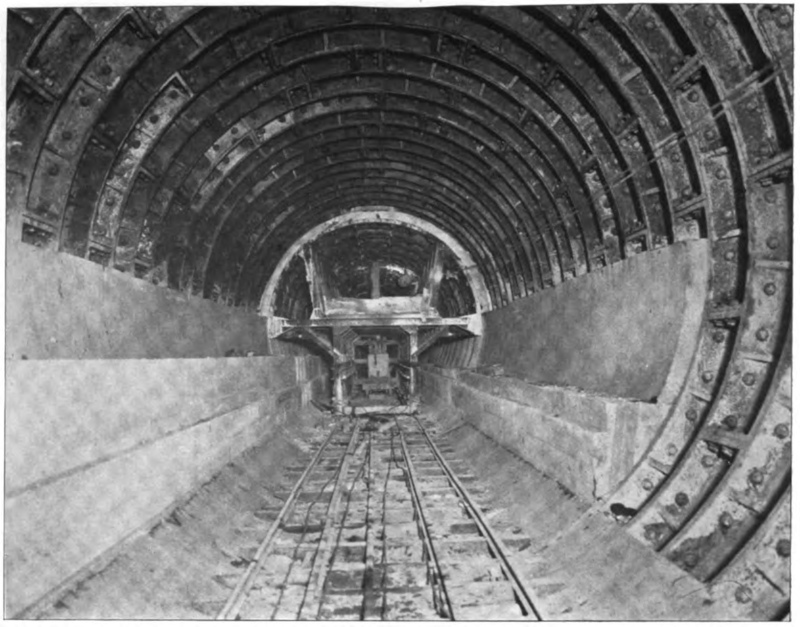 Montague Street Tunnel Line, Placing of Concrete Lining in Progress. PSC report 1916. This is a two-track line extending from the Broadway-59th Street subway under Canal street to and over the Manhattan bridge to a connection with the Fourth Avenue subway in Brooklyn. The turnout from the line on Broadway to Canal street was included with the contract work on Broadway. The line from Broadway to the Bowery is known as Route No. 20, Section No. 2. The portion east of the Bowery was built by the Department of Bridges. Route No. 20, Section No. 2. — A two-track line under Canal street from Broadway to the Bowery. A particularly difficult problem was met at Lafayette street at the crossing under the present subway. Plans were made calling for special steel pile construction to carry the heavy subway loads down to hard-pan, considerably below the subgrade of the new structure. Contractor, Underpinning & Foundation Company. Date of contract, July 16, 1914. Contract period, 32 months. Summary of contractor's bid, $1,822,944.25. 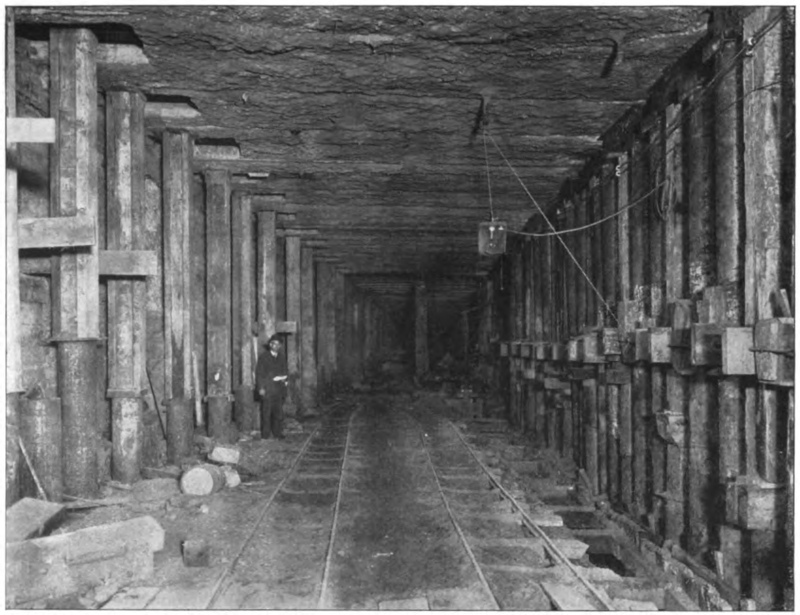 Canal Street Subway, Special Foundations and Piling at Undercrossing of First Subway. PSC report 1916. Two tracks, one island platform. When first planned, the 60th Street Subway was to be a line over the 59th Street (Queensborough) Bridge. To ease the ramp-up to the bridge, there were to be two one-track stations, under 59th and 60th Street. When plans changed to make the line a tunnel to Queens, for political reasons, the northern station, in 60th Street, was expanded to two tracks and the southern one was abandoned while under construction. The crossunder at 59th Street between the platforms of the IRT line utilizes part of the original BMT station construction. In October 1973, a platform extension eastward opened, along with a new exit to 3rd Avenue and 60th Street. Two escalators and a stairway lead to the new mezzanine at this end of the station. This station has been renovated and features small red "Lex" mosaics in the tile. There are crossovers which connect to the IRT East Side local and crossunders which connect to the IRT East Side express. The station has high ceilings and in places the fare control rails overlook the tracks. Two tracks, two side platforms. This station has been totally renovated, and features the standard mosaic tile bands, icons, and name tablets, plus some extra decorative elements in the otherwise plain white wall tile (for instance, see the orange tile columns under the numeral icons in the photos). Mosaics indicating "Queens Trains" and "Brooklyn Trains" are in the 60th Street mezzanine. This mezzanine features a passageway to Fifth Avenue and Central Park and a crossover between directions. This station is skewed on the street grid to shift the line from 59th Street to 60th Street. Express station with two island platforms and four tracks. This station is in fact the terminal station for many of the BMT services when both the Manhattan Bridge and tunnel connections to Brooklyn are open. To handle the dispatching duties, an active tower is at the south end of the southbound platform. From here, the local tracks turn into to the 60th Street tunnel and the express continue to the 63rd Street tunnel to Queens. 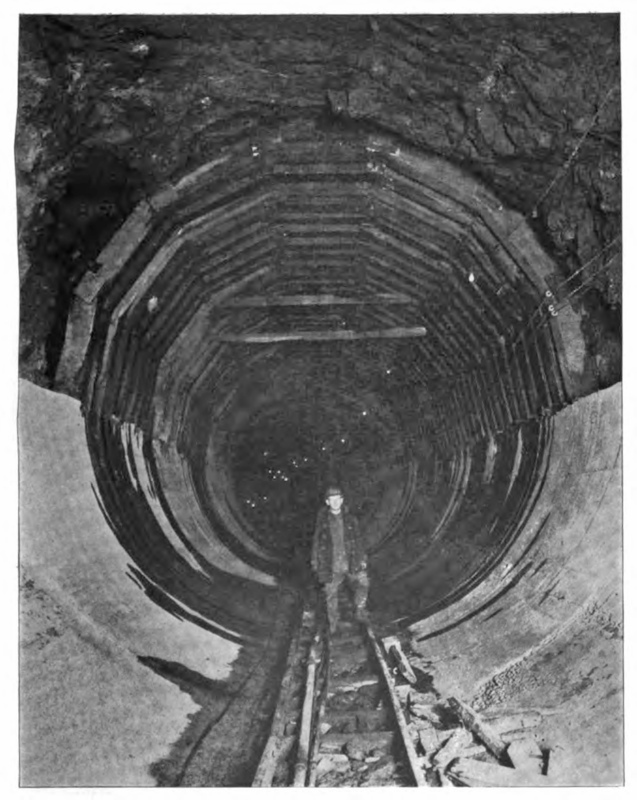 The intent of this station was to join the 60th Street line with a line continuing under Central Park. It would be a four-track line along Central Park West to some indefinite northern terminus. The tracks do curve to the west to begin the swing from 7th avenue to C.P.W. When the 63rd Street line was built, the express tracks had to make a reflex curve to now head east. Before the 63rd street line the express tracks continued as layup spurs north of the station. However they were only about 400 feet long. Because they are tied together by a double crossing north of the station, the clear length is only 330 feet or so, not long enough for a six-car train of BMT Standards (just over 400 feet). Hence in historical times they were practically useless for layups or anything else. Local station with four tracks and two side platforms. Exits at both ends of the platform with platform level fare control; the northern exit leads to 49th Street and the southern exit leads to 47th Street right across from the TKTS booth in Duffy Square. No free crossover/under between directions. 49th Street was built to resemble the other local stations along Broadway, but in October 1973 underwent an experimental modernization program, which included new wall tile of red glazed brick (said to resemble a giant fireplace), special soundproofing installed in the ceiling, and terrazzo tile floors on the platforms. The soundproofing experiment wasn't repeated at any other station in the system. The platforms seem unusually narrow (probably because the new brick was added on top of the existing tile wall reducing the width of the platform by several inches. A glimpse of the typical BMT tile wall from prior to the renovations can be seen in this photograph (look at the far platform). The station serving the BMT Broadway line is an express station with four tracks and two island platforms. Formerly, stairways and a ramp at the north end led to a mid-level mezzanine, but the renovation efforts have removed the ramps (which, while convenient, were too steep to be ADA-compliant) and replaced them with stairways and new elevators to the mezzanine. This mid-level mezzanine above the tracks features a large oval balcony looking over the trackway and helps to reduce the sense of claustrophobia described by many riders. 34th Street/Herald Square is a massive complex serving the IND 6th Avenue, the BMT Broadway, and the PATH line from New Jersey. As one might expect, this is the third busiest station complex in the system. There are numerous exits and passageways including a direct entrance to the shopping center that has variously been known as Gimbels, A&S Plaza, and Manhattan Mall. The station has exits from 30th St. at the south end, to 35th St. at the north end, and various others in between. Until the mid-1980s a passageway was available to connect, outside the fare control, to the IRT 7th Ave./West Side line and to Penn Station and the commuter railroads there, but this was closed citing security concerns and the lack of desire of the private property owner to maintain it. Prior to a 1990s renovation effort, this was a dungeon of a station complex. The lighting was miserably faint, signs all mixed up, stairs dark and tricky. The renovations have improved all aspects of the station, although little of the original IND or BMT decor was kept. The combined stations are blended into a unified scheme of decor. The 6th Avenue station received new "34" monogram tablets installed along the trackside walls (these are not mosaics). The tile is white with two rows of bright red accents. The BMT station retained its "Dual Contracts"-style "34" mosaic monograms. Artwork REACH New York, An Urban Musical Instrument, Christopher Janney, 1996. Located about mid-way on each BMT Broadway Line platform. Artwork Radiant Site, Michele Oka Doner, 1991. In the transfer mezzanine at the north end of the station. Artwork Yab-Yum, David Provan, 1992. Hanging over the northbound platform/trackway of the IND 6th Avenue station. Artwork Halo, Nicholas Pearson, 1991. In the mezzanine at the south end of the IND 6th Avenue station (near PATH). A local station, recently renovated. The 1970s renovation tiles were removed revealing the original mosaic name tablets. A sealed off crossunder is outside the fare control, with most of the evidence of its existance removed during the renovation. At the north ends of the platforms, a false curtain wall was installed shortening the platform by about 10-15 feet. The area is visible from passing trains and one can see some more original "28" mosaics and tile band in the sealed off areas. New mosaic artworks have been installed all over the renovated tile walls. Local station with side platforms. The platforms had been done up in the 1970s renovation style, but were recently renovated again, revealing the original "Dual Contracts" tile band and name tablets. New mosaic artwork featuring hats was installed on the platform walls. There is a closed crossunder at the 22nd Street end and there is evidence of a removed crossunder on the uptown side outside the fare control. Express stop with two island platforms. The 14th St. station is approximately 30 feet below street level. This station has recently completed a renovation, with new elevators, platform tile, and paint (and numerous other improvements). A mosaic on the platform side walls is a depiction of "the junction of Broadway and the Bowery Road, 1828" (Lee Stookey, Subway Ceramics, page 84), now better known as Union Square. The mezzanine level has been reconstructed as well; some former passageways and stairways have been closed off, including one immediately adjacent to the southernmost staircase on the northbound side. The mezzanine has some new tile name tablets and some original directional mosaics ("To 14th Street" and "To 16th Street") which have been preserved. The mezzanine permits crossover and transfer to the IRT East Side Subway and BMT 14th St./Canarsie Subway. Local station, recently renovated. The 1970s renovation tiles were removed revealing the original mosaic name tablets. There is an additional exit (with iron maiden) at Waverley Place on the south end of the platforms. Also at the south end is evidence of a closed crossunder passage between the platforms. There is a newsstand on each platform near the fare control. New mosaic artworks have been installed all over the renovated tile walls. Local station, recently renovated. You can see in the photos the 1970s "big rectangle" tile style (white with yellow where the name signs were located). The renovation restored the original name tablet mosaics and tile band. The fare control area is down a short corridor in the center of the platform; there are no other exits and there is no crossover/crossunder. There are actually two distinct stations called Canal Street serving the Broadway Line. One is on the main subway line under Broadway and serves the local trains; and the other is on a two track spur subway leading to the Manhattan Bridge under Canal Street, and serves the express trains. The main line Canal Street station is a typical local station with two side platforms surrounding four tracks. The station has recently been renovated to restore the original look, with new mosaics featuring Chinese lettering to indicate this station's presence in the vibrant Chinatown neighborhood. The Chinese symbols on the red plaques mean "money" and "luck", and the tablet has ideographs that actually read "China" and "Town". One of the station's original mosaic tablets has been preserved at the Transit Museum. The express line to the Manhattan Bridge stops at a lower level station, which has two tracks and two side platforms. The express tracks visible at the BMT Broadway local station at Canal Street are not actually express tracks and have never been used in regular service. They originate at the unused lower level of City Hall, run past Canal Street, and then dead end, just before the bridge tracks rise in their place. This is a remnant of changes made when the Manhattan Bridge was included in subway service plans in The Dual Contracts era. Originally it was intended for Broadway local service to originate at City Hall upper level and proceed north on the local tracks. The tracks coming from Brooklyn via the Montague Street Tunnel were to run though the lower level of City Hall, and then continue as the express service up Broadway. The tracks from the Manhattan Bridge were to stop at the Canal Street bridge line platform, and then proceed crosstown on Canal Street to the Hudson River. During much of the Manhattan Bridge reconstruction project, this station was "abandoned", and only used as part of the transfer between the BMT Broadway local station and the BMT Nassau St. station. For a short time in 1997, during one of these periods of closure, an art exhibit known as the Canal Street Canal, by artist Alexander Brodsky, was installed on the northbound trackway. It involved installation of a large waterproof tub filled with water, with Venetian canal boats floating inside. The Bridge Line station has been reopened since July 22, 2001. City Hall is a local station with one large, irregularly shaped island platform. The fare control is in the center of the platform, leaving the ends open for crossing over between directions. An active tower is at the north end. The trackside walls feature a mosaic rendering of the City Hall cupola. Built along with the rest of the Dual Contract lines and opened in 1918, the active platform at City Hall Station was originally designed to be a stub terminal for local trains, following the pattern in which almost all of the Manhattan subway lines were built. Local trains were to terminate inside the borough while express trains would diverge and cross the river into Brooklyn. The IND 8th Avenue (locals terminate at World Trade Center), the IRT East Side (locals terminate at Brooklyn Bridge-City Hall), and IRT West Side (locals terminate at South Ferry) lines all follow this pattern, as does the IND Fulton Street line in Brooklyn as it was initially operated (locals terminated at Court Street). To accommodate the express trains, therefore, City Hall station was designed with another set of tracks and platforms on a lower level. The plan was that the Brooklyn-bound express trains from upper Manhattan (and the Bronx, had a northern extension of the Broadway Subway been built) were to use the lower level, connecting to the subway running under Church Street and Trinity Place, and then to Brooklyn via the Montague Street Tunnel (as the line is operated today). Plans were changed when it was decided to run subway trains over the Manhattan Bridge. The express trains were diverted from Broadway under Canal Street leaving only the local trains running south under Broadway to City Hall. The upper level platform was then converted into a through platform, which explains part of the irregular shape of the island platform on the upper level. The southbound side of the platform is straight as an arrow, and the northbound side is curved at the south end. But, the trackside wall on the northbound side is straight; there is a space between the wall and the track itself at the south end of the northbound side of the station. Immediately south of the station the tracks ramp down to meet the lower level grade to continue south along Vesey Street and into Church Street. The local tracks on the upper local sit above the outer tracks on the lower level. The columns on the platform delineate the tracks and platforms under them. That change in plans rendered the lower level at City Hall unnecessary, and in fact, no service has ever been operated on the lower level. The fact that the Broadway line was never extended northward contributed to the fact that the lower level has never been used- there is simply not enough traffic on this line to support two river crossings and a Manhattan terminal. This may some day change if the BMT Broadway line is ever permanently served by either the 63rd Street tunnel or the 2nd Avenue subway. The lower level was never even finished; there are no wall tiles on the lower level and the steel beamwork has a decidedly rough look to it. The platforms are narrow, and only the west one has a finished top and stairways to the upper level platforms. Stairways on the eastern side platform don't appear to ever have been "punched through" the floor on the upper level. The lower level tracks are used for train storage; north of City Hall the lower and upper level tracks rise into a typical four-track express/local configuration but the "express tracks" are really just tail tracks; there are crossovers just prior to entering Canal Street; the center tracks themselves dead end at concrete bumper blocks about 2/3rds of the way into Canal Street station. Track Map of the BMT Broadway Line in the City Hall area. A persistant rumor concerns a plaque that might have been installed at City Hall honoring Beach's pneumatic subway. The New York Times even reported on its placement on February 27, 1940. No such plaque exists here or anywhere else in the subway system. It is unclear whether it was ever placed at all. Cortlandt Street/World Trade Center is a local station with two side platforms. In 1998/1999 this station was completely renovated at platform and underpass level. The station walls, formerly identical to those at Rector and many others along this line, had the "large-rectangle" tile removed to reveal the original BMT name tablet and monogram mosaics underneath (as well as the "To Hudson Tubes" directional tablets, which were thankfully preserved even though the Hudson Tubes name has fallen mostly into disuse). The fare control for this and many of the other stations on this line are at platform level on each side, which means that riders cannot switch directions without exiting fare control. The underpass at the north end allows access between the two platforms and via three escalators into the World Trade Center shopping concourse. The underpass has an artwork featuring commerce through the ages, called Trade, Treasure, and Travel (see below). The south end also has a fairly deep underpass, reachable by stairways and a single "up" escalator on each side. From this underpass, there was access to the World Trade Center concourse and into 1 Liberty Plaza office tower, and via that building out to Broadway. Local station, two tracks with two side platforms. This station was redone in the NYCTA 1970s "large-rectangle" tile style, and very little of the original mosaic work survices. At the extreme north end of the northbound platform there is a name tablet mosaic and a small "R" along the upper edge. A mosaic border with "R" monograms is present in both the north and southbound fare control areas. During the 1970s renovations, the station was reduced in size by placing a false wall across the platform at the north end. From the northbound platform, one can see into the abandoned space on the southbound side, including the location of painted-over mosaic name tablets. The space on the northbound platform has been turned into rooms for various services (signals, electrical). Three tracks with two island platforms. The center track is used for some short-turn trains to and from Queens. The station has been undergoing renovation for what seems to be a long time; the platforms at the south end and the crossover area have spongy plywood flooring. At the south end, one flight of stairs leads up from each platform to a small crossover area; from here, two escalators and a stairway lead up to the fare control. Mosaics include a picture of the area and small "W" tablets. Part of the renovations supposedly include elevator access but no sign of this is apparent as of yet. At the north end, there is a part-time exit and a closed mezzanine. Island platform with rounded trackside walls. There are small mosaics of Brooklyn Borough Hall in addition to the mosaic name tablet. This station is the deepest of the three Borough Hall stations and is served by escalators at the south end and elevators at the north end to the fare control and street. The elevator has front and rear doors for crowd control. There is a unique mosaic for a local church outside the fare control. The south mezzanine has connections to the IRT Borough Hall stations. Some relatives depths of stations in the Borough Hall/Court Street complex are as follows (measurements unscientific, +/- 10 feet). Formerly known as "Lawrence Street-Metrotech", and prior to that, simply "Lawrence Street." This station features curved side walls with a full length mezzanine with mosaics "to Lawrence Street", and "to Bridge Street". The north fare control is six steps up from the mezzanine. There is a wheel detector signal to enforce speed limits at the north end of the northbound track. This station was extended in the 1970s over a crossing west of the station. The new platform area is column-less; the platform fills the former switch well. There were steel flaps at the end of the original platform that were lifted up and away from the platform edge when trains moved over the switch. With the platform extended a new crossing was built in the tunnel between here and Court Street. In December, 2010, a transfer corridor opened connecting Jay Street-Borough Hall of the IND with the Lawrence Street-Metrotech Station of the BMT. The project began in 2007 and included full rehabilitation of the Jay Street Station, and installation of full ADA accessibility to both the Jay Street Station and Lawrence Street Station platforms. The new transfer connector runs from the east side of the Jay Street Station mezzanine to the (railroad) north end of the Lawrence Street station, a total distance of about a half-block along Willoughby Street. The station names were changed to reflect this unified station complex. Compass-west (railroad north) of the Lawrence Street Station, in the tunnel, there was a small platform fitted with a roll-up door (like a loading dock) used by the transit authority's revenue collection trains to make drop offs at TA headquarters located above. The platform is still visible just past the crossover on the Manhattan bound side. Cash is no longer delivered by revenue train; instead, the TA uses armored trucks. Broadway Subway Now Open (1917). Public Service Record, September, 1917. Opening of the Broadway Subway (1918). New York Times, January 1, 1918. Broadway Subway Opens (1918). Electric Railway Journal, January 12, 1918. Broadway-Fifty-ninth Street Extension of B.R.T. Subway, Opened to Queensboro Plaza... (1920) "New Line Supplements the Existing Extension of the Interborough Subway and Affords a Direct Route Without Transfer Crosstown and Downtown From Queens Borough." New York Times, March 16, 1919.